Oscar fish, a type of cichlid, are properly known by their scientific name, Astronotus ocellatus. Although these fish are not particularly fussy about food, keeping their environment clean is an essential part of oscar fish care. Like all tropical fish, Oscars require clean, fresh water in their tanks, proper food and, especially for Oscars, a good quality filtration system. They also have some additional requirements because of their powerful size and strength. Oscar fish are among the largest freshwater fish, and it's not uncommon for them to grow up to 12 inches long. Since they can get very big, you will need an aquarium that accommodates them comfortably. Plan to keep only one or two Oscars in a large 125-gallon aquarium. If this sounds excessive, keep in mind that these large fish need room to move. Tighter quarters can also lead to overcrowded and unsanitary conditions, which in turn can lead to disease. Err on the side of caution and choose the largest tank size you can afford. Be sure to place your aquarium on a sturdy stand or table and in a location where you can enjoy watching your fish. Make sure the tank and table are completely level. An uneven tank puts extra pressure on the side panel seals, which can lead to leaks. A high-quality, charcoal filtration system is absolutely essential for all home aquariums, but it's especially important for Oscar fish because of how much waste they generate. Remove solid waste such as food particles from the water. Fish routinely create ammonia during respiration and excretion. Unless steps are taken to remove ammonia from the water, it can quickly build up and kill the fish. Buy the best quality filtration system you can afford. Follow the manufacturer's recommended instructions for care, maintenance, and cleaning. Keep your filter running at all times. Remove and replace about 10 percent of the tank water on a weekly basis. According to the site Oscar Fish Lover, Oscars can jump, and have been known to leap to their deaths from an unshielded aquarium. Purchase a light fixture and hood attachment that fits snugly and securely over the top of the aquarium. Make sure that the flaps on the tank hood have a latch on them, or use bricks to hold them down. An Oscar fish can actually open them if he bangs into the aquarium hood. One trick to prevent Oscars from jumping is to keep the underside of your tank hood and lids scrupulously clean. In the wild, insects and plant debris landing in the water create a ripple that attracts the fish to the area. It's like a dinner bell ringing for them. In captivity, moisture dripping from the underside of the tank hood or bits of fish food stuck to the hatch can fool an Oscar into thinking a meal has arrived. By keeping the hood clean and latched, you can keep your fish where you want them and where they need to be - in the tank! One of the most fascinating aspects of keeping Oscar fish is their habit of rooting among the accessories in their tanks. They can easily lift out plants and even move rocks across the aquarium floor. 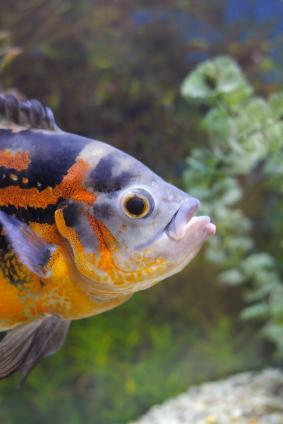 Like their namesake, Oscar Madison in The Odd Couple, they are the messy fish in the aquarium. Don't be surprised if they dig trenches in the gravel, move your carefully positioned plants, and otherwise change their tank. Since this behavior can get expensive, especially when they pull up live plants, consider adding artificial plants to the aquarium. Your Oscar fish won't mind. Remember that Oscar fish come from warmer, tropical climates. They need their tank water kept between 72 to 77 degrees Fahrenheit. You can do this by using an aquarium heater set to the proper temperature. Avoid glass heaters because Oscars have been known to break them. There are shatterproof aquarium heaters that work well in Oscar aquariums. Your goal with any aquarium should be to maintain the tank in the same conditions as your fish would encounter in the wild. Oscar fish require a water pH of around 7.2, or alkaline. Use a cichlid buffer or a water conditioner especially for cichlid fish and use an aquarium water pH test kit to measure water pH. 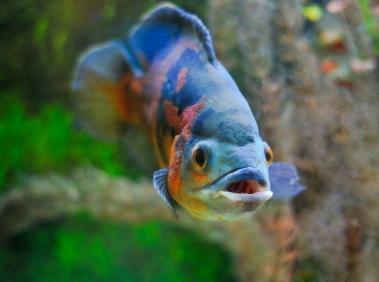 When keeping Oscars as aquarium fish, choose a commercial fish food suitable for carnivorous fish like Oscars and other cichlids, and supplement their diet with mealworms and insects. They will eat other fish, so be careful about placing smaller fish such as guppies or goldfish in the tank with them unless choosing feeder fish specifically to enhance your Oscar fish's diet. Oscar fish are among the most long-lived aquarium fish when given the right habitat. Choose a roomy aquarium, provide a good filtration system, and feed them the proper diet. This will help ensure that you'll be able to enjoy your beautiful fish for a long time to come.